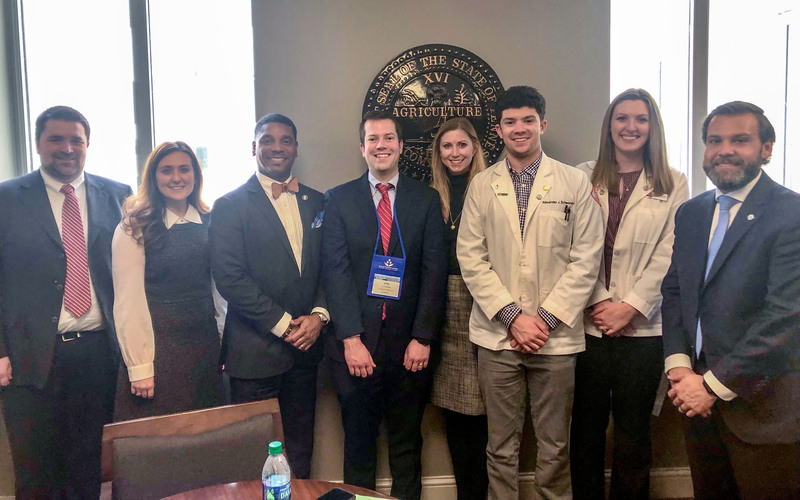 In February, I had the opportunity to spend time with state lawmakers and advocate on behalf of the healthcare community for patients with chronic pain and patients in need of opioid use disorder (OUD) treatment during the Tennessee Pharmacists Association (TPA) Pharmacy Day on the Hill at the State Capitol in Nashville, TN. This event provides opportunities for pharmacists and pharmacy professionals from across the state to connect with fellow pharmacy professionals and legislators, challenge the current status quo for pharmacy practice, and collaborate to improve patients’ lives through idea-sharing and innovation. This advocacy effort was well timed as the Tennessee House Republican Caucus unveiled its Healthcare Reform plan known as ‘Health CARE Plan’ and Governor Bill Lee recently announced $11.2 million in funding for treatment of mental health and substance use disorders. While on the hill, I spoke with caucus leaders and high-ranking members of the Senate and House chambers about the need to 1) support providers in caring for patients with acute and chronic pain, and 2) make substance use disorder treatment more accessible and affordable. This topic is one that unites parties and legislators on both sides of the aisle. Of high priority for the general assembly is the Tennessee Together opioid legislation that was signed into law in 2018. The law positioned Tennessee as one of the most restrictive states in the nation regarding healthcare providers’ ability to make opioid-related care decisions for patients in pain. Amendments to this legislation would be aimed at ensuring providers can effectively care for their patients while also deploying strategies to mitigate opioid misuse and abuse. Another priority topic among legislators was the importance of making substance use disorder treatment accessible for patients in need. For far too long, medication-assisted treatment (MAT) has been stigmatized. However, research and real-world clinical practice has shown greater treatment success for those with OUD when pharmacological treatments are used in conjunction with behavioral health support. The acceptance of MAT has become more prevalent in recent years, but we still have a long way to go to ensure adequate access and coverage, assess and standardize quality care delivery, and proactively identify and provide resources to those at risk. Physical and emotional pain are incredibly personal experiences. One way to continue to progress this effort is to have open conversations with legislators, business owners, colleagues, friends and family about how- through words or actions- we can best support those in need of treatment. Every negative comment, sideways glance or dissenting mannerism can deter someone from seeking the help they need. Through my work at axialHealthcare and TPA, my goal has always been to ensure patients in pain and those suffering from OUD have access to high-quality care. It was an honor to speak as a healthcare provider on behalf of these issues that affect so many and give a voice to individuals who may not otherwise be heard.